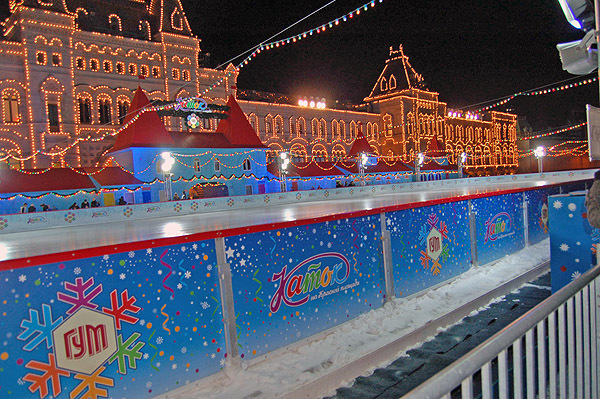 Red Square Ice Rink. Photo courtesy Noah Rucker. In the course you will find a "welcome" letter from me that was first composed for, and makes reference to, HIS 242, the second part of this survey of Russian history. I will only add a few nostalgic words here, but commencing our examination of Russia’s history takes me back to my own first curiosities about Russia. In 1957, I witnessed the “sputnik mania” following the launch by the Soviets of the first artificial earth satellite. I was twelve. Soon my local school system (in Orlando, Florida) had taken some of us 7th graders and basically jumped us ahead to 9th grade algebra and science courses, hoping to stimulate a future generation of engineers and scientists. I was motivated in this direction for a time, but halfway through my freshman year at the University of Florida changed my major from aeronautical engineering to history. My dad was a great reader of history and growing up amidst his books, and listening to his retelling of historical episodes, made me think this might be an appealing major, but I really had no idea about the work of historians and my decision was a lightly-considered one. A few years later, I transferred to Stetson University in a small central Florida town… in part to get away from the factory-like atmosphere of a large university, but also in part because I was now beginning to focus a little more clearly on my future. I was actually drifting back and forth between history and literature as my major and wanted to reach a decision one way or another. Stetson University had a very eminent historian of Russia, Serge Zenkovsky. I knew of him by reputation. He was in semi-retirement from a career at Harvard and elsewhere and had settled in central Florida to tend his orange groves and his undergraduate students of history. I can well recall walking into his survey of Russian history in the fall of 1966. He was one of the founders of Russian studies in the U.S. and author/compiler of a standard work in early Russian history: Medieval Russia’s Epics, Chronicles, and Tales. In his course we were assigned the first edition of this work (you won’t use it in this course, but we will read together portions of the Russian ‘primary chronicle’) and also the first edition of the textbook you will read (in its 7th edition) for this course, by Nicholas Riasanovsky of the University of California/Berkeley. Taking this course cemented my interest in history and in the history of Russia in particular. After all, he was a brilliant and inspiring instructor, I had been swept into the post-sputnik maelstrom, and had experienced—as a grade school student—several years’ worth of “duck and cover” drills (if you don’t know what this was all about, ask me). Why not get to “know your enemy”, the Soviet Union, through extensive study of its past? Well, things go around and come around. I got to know and love Serge Zenkovsky, and he would two years later steer me into my grad school majors of Russian history and economics. I would later host him for a guest lecture at NVCC, in 1980. He died in 1990. Years later, I would also come full circle with the sputnik launch. The Cold War had some strange tricks to play. One of them was that the son of Nikita Sergeevich Khrushchev, the Soviet leader who promised to “bury” us (a misunderstood remark, by the way… and something we can discuss later), would become a U.S. citizen in the 1990s. He now resides in Providence, RI and teaches at Brown University. In October 2007, to mark the fiftieth anniversary of the 1957 launch, I was able to bring him (Sergei Nikitich Khrushchev) to NVCC for a wonderful presentation that drew an SRO crowd. He is a lovely gentleman and scholar who is the author of several commendable works of history. In the 241 course you will meet many fascinating Russians—rulers such as Ivan IV (the Terrible… we need to discuss what this meant), Peter the Great and Catherine the Great (we’ll find out why they both were), the tsar liberator Alexander II (who freed the serfs and was martyred for his trouble), rebels like Pugachev, usurpers like Boris Godunov, and wonderful figures from Russian culture such as Alexander Pushkin (see below) and Ivan Turgenev (we will read together his timeless Fathers and Sons, a novel about intergenerational conflict in Russia circa 1860). Okay, this has gotten far longer than I intended. I am pretty old but not quite old enough to have known Peter the Great (but I did interview his biographer Robert Massie, in the mid-1980s, and you’ll read an abridged version) or Leo Tolstoi (but I did meet his daughter in the 1960s). Before completely boring you with reminiscences, let me simply link you to a few items of possible interest below. Check some selected resources (both book and web) that we recommend to anyone interested in Russian history and culture.